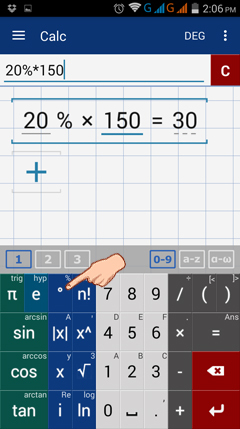 Tap the degree key twice to use the % key. Use this key when performing operations with percents. 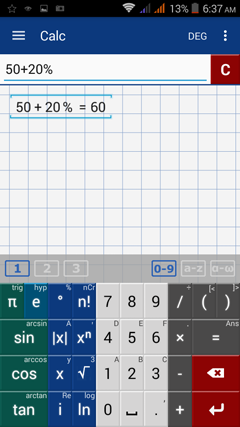 Tap the following keys in order: 2, 0, %, ×, 1, 5, 0. 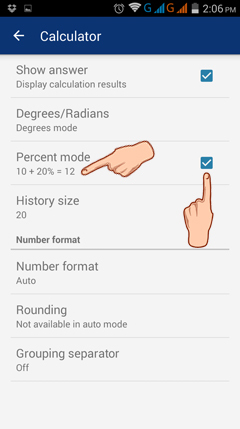 Use percent mode to add and subtract percents by tapping menu button and going to Settings > Calc > Percent Mode. 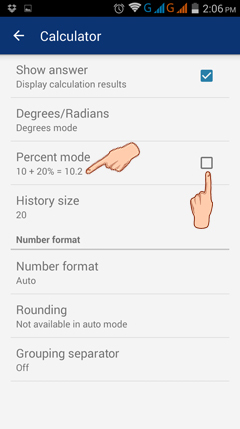 There are two percent modes. The first converts the percent into a decimal (e.g. 10 + 20% = 10.2). Uncheck the box to use the first mode. The second considers the percent as a percentage of the first number (e.g. 10 + 20% = 12). Check the box to use the second mode. Use the 1st mode to add 20% to 50. Note: Typing 20% before 50 automatically converts 20% into a decimal (0.2). 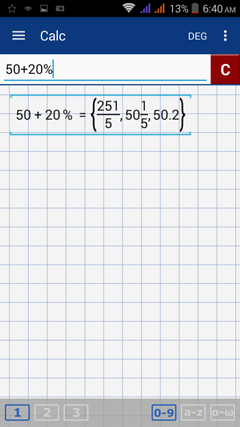 Use the 2nd mode to add 20% to 50.